The moves come as Disney seeks ways to extend beyond the traditional cable-bundle format as more people watch TV online. Sports network ESPN was once a jewel in Disney's crown but subscriptions have been falling as people drop cable services. Disney's franchises such as Marvel's Avengers and "Star Wars" have been raking in money. "Avengers: Infinity War" has grossed over $1 billion since it opened April 27. In a statement, CEO Bob Iger said Disney was "very well positioned for future growth" because of its ability to take advantage of such franchises across all businesses and "the unique value proposition" it's creating with direct-to-consumer streaming services. To prepare for the future, Disney launched a sports streaming service with video not available on the regular ESPN channels. This includes additional baseball and soccer games, and the entire "30 for 30" documentary series on demand. 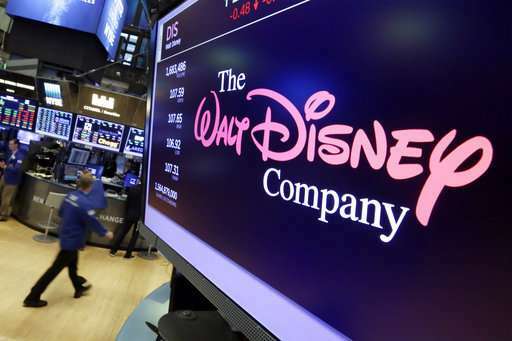 The Walt Disney Co. is also working on an entertainment streaming service with classic and upcoming movies from the Disney studio, shows from Disney Channel, and the "Star Wars," Marvel and Pixar movies. That service will launch in late 2019 and will include movies leaving Netflix once its deal with Disney expires. If the $52.4 billion Fox deal goes through, Disney could supplement the entertainment service with Fox properties—such as X-Men movies and National Geographic programming. Disney is still awaiting regulatory approval, and published reports say Comcast is mulling a counter bid.